Manual Universal Penetrometer - Gilson Co. The HM-320 Manual Universal Penetrometer is ruggedly constructed for accurate, sensitive measurements. The aluminum base has a machined, grooved table with leveling screws and rubber inserts to protect tips of needles and cones. 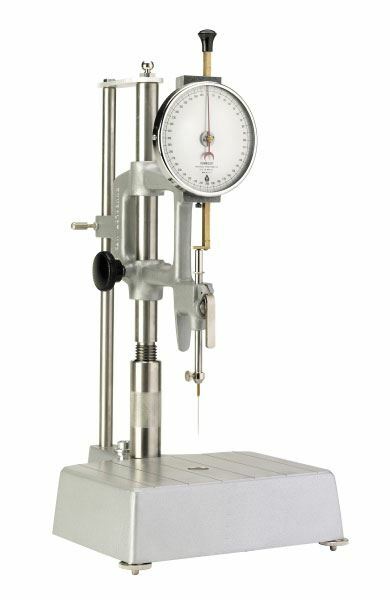 Two stainless steel rods act as support guides for a cast aluminum head with coarse/fine adjustments and a calibrated friction-free plunger mechanism. Indicator dial has zero reset and is graduated in 400 divisions of 0.1mm, corresponding to 40mm penetration. Any needle or cone with standard 1/8in (3mm) diameter stem can be mounted to the 47.5g plunger assembly. A standard 2.5g ASTM D 5 Needle and two additional loading Weights (50g and 100g) are included.